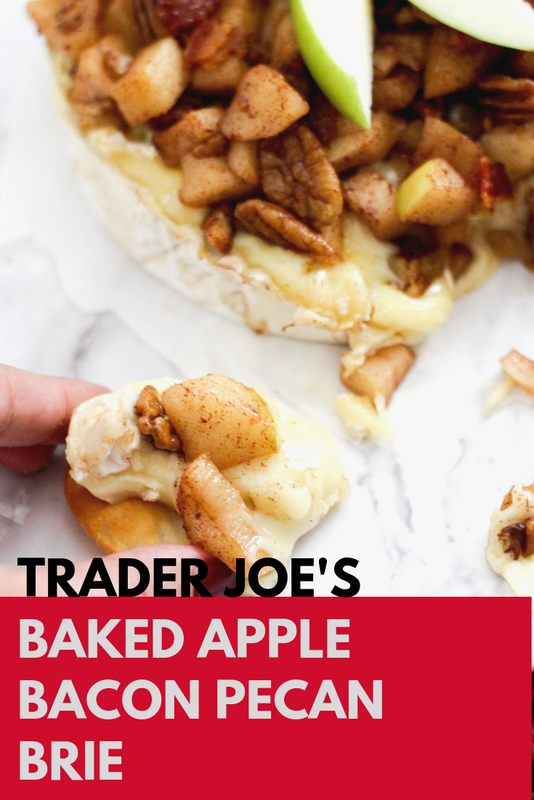 Honestly, I've tried to write a few intro paragraphs for this recipe but all I keep coming back to is the fact that the name should sell it all - I mean, a warm, gooey Brie covered in rich cinnamon sugar sautéed apples and pecans then topped with salty crumbled bacon, all from Trader Joe's and so, so easy to pull together - what more can I say!? Perfect for girl's night, holiday get together's or whenever you need a warm Brie, this little number comes together with minimal effort and prep work, so get on it! Recipe inspiration comes care of my friend and incredibly talented photographer Ashley Cardoza who always knows when I need a little Brie in my life. Line a baking tray with tin foil, lay out two pieces of bacon, cook in oven until crisp. Remove from oven, turn oven temperature down to 150 degrees. Peel, slice and dice the apples, add them to a skillet with the large tablespoon of the cinnamon sugar butter spread. Stir and cook them on medium low heat until they are soft. Continue to stir occasionally to ensure the butter is evenly spread on the apples. If you're feeling generous, add a little more butter to really get things going. Once the apples are soft, add in the pecans, stir to coat pecans in the butter, turn off heat. While the apples and pecans are warming together in buttery goodness, line a baking sheet with parchment paper. Heat Brie to your desired level of warmth/gooeyness. I left mine in for maybe 5 minutes. Top with warm apple and pecan mixture and then crumbled bacon. Serve immediately with crackers and fruit. The salty bites of the bacon pair perfectly with the rich, gooey apples and are plain Heaven when served with fresh raspberries and crackers. I might just make myself one for dinner!